Recently, NASA published a flashy report outlining steps for sending humans to Mars within the next few decades – calling such a mission “within our reach.” Given NASA’s efforts to put a man or woman on the Red Planet, the idea that humans might one day colonize Mars is not as far-fetched as it sounds. Science fiction writers have long hypothesized what a human expedition to Mars would entail, and many have fantasized about the social and moral implications of a human encounter with extraterrestrials on such an expedition. Mac Rogers’ The Honeycomb Trilogy takes that premise a step further and explores the ramifications of an alien encounter on Mars and the aftermath for the population of Earth. Exploring themes of social collapse, utopian versus dystopian dynamics, and sociological barriers to interaction, part I of the trilogy, Advance Man, hints at a cataclysmic event that will dramatically alter life on Earth while simultaneously exploring the relationship dynamics of one suburban family. This suspenseful and riveting prelude to The Honeycomb Trilogy will leave you clamoring for tickets to see Blast Radius and Sovereign, parts II and III of the trilogy. 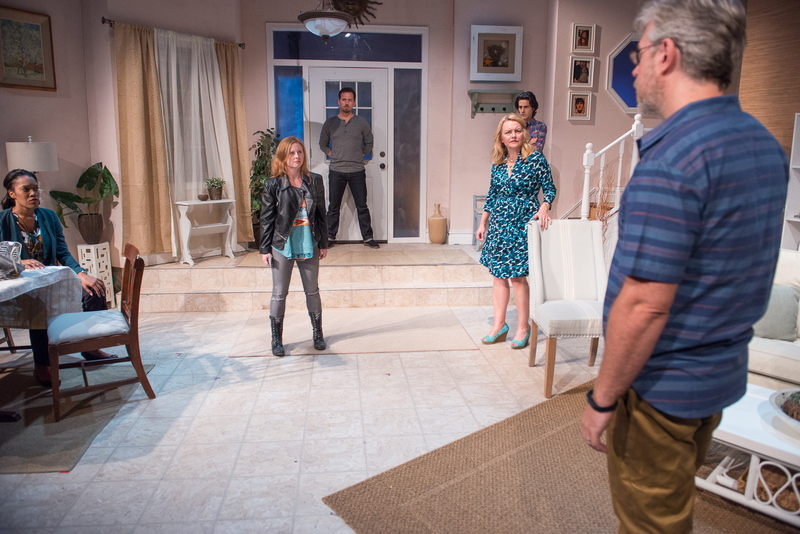 Advance Man introduces Bill, Amelia, Ronnie, and Abbie, a family filled with conflicting personality types living in a charming Floridian suburb. Bill raises his children with his wife Amelia, a homemaker, while leading a startup company focused on alleviating food shortages globally. At least, that is the advertised purpose of the organization. A former astronaut, Bill and his wife have taken Conor, a former member of Bill’s crew, into their home after he suffered an apparent stroke during the crew’s last mission to Mars. The couple lives with their daughter, Ronnie, a bold truth-seeker who challenges authority (both inside and outside the house) and her brother, Abbie, a sensitive and artistic soul who escapes into his comic book sketches. Abbie’s latest creative venture, a graphic novel featuring The Honeycomb, is filled with insect-like aliens that live in a hive – a concept implanted in Abbie’s mind by his father. Between addressing Ronnie’s school fights and her rebellious attitude, Amelia begins to suspect that her oft-absent husband is having an affair. However, all is not as it seems, and Amelia’s suspicions uncover something far more sinister: an alien invasion plot concocted by Bill and his crew that will result in total social collapse and the redevelopment of earth as an agrarian society. Rogers’ play integrates all of the elements of a traditional alien encounter tale while playing on modern fears including loss of electronic communications, over population, and powerlessness in the face of questionable authority. The distinction between utopia and dystopia is a matter of perspective and this truth comes to bear in Ronnie’s confrontation with her father – Ronnie proclaims her father’s post “apocalyptic” agrarian society an undesirable future and violently confronts his efforts to force his vision for mankind’s fate upon her (and the rest of the world). Moreover, Advance Man explores the character traits that are most desirable in a new cultural habitat. Abbie’s empathy and kind-hearted engagement with Conor will undoubtedly benefit him when interacting with the new alien species that colonizes Earth. His sister, on the other hand, fights unreservedly when faced with serious threats to her way of life and to protect those she loves. Both characters bear personality traits that will allow them to navigate a new social and cultural climate, but both equally rely on one another to make up for their emotional and physical deficiencies. Director Jordana Williams and designers Jennifer Wilcox (lighting), Sandy Yaklin (scenic), Jeanne Travis (sound), and Amanda Jenks (costume) make the most of The Gym at Judson, crafting a suburban U.S. microcosm in midtown Manhattan. Also, during the dramatic climax sequence, the creative team deftly transforms the (appropriately) bland upper middle class home into the epicenter of a hive of swarming alien insects using impressive lighting and sound techniques. Every member of the Advance Man ensemble gives a strong performance; however, there are several exceptional members of the cast, including David Rosenblatt as the sensitive soul Abbie and Becky Byers as the tenacious and strong-willed Ronnie. Rosenblatt’s introspective repose and almost meek appearance makes him an unlikely survivalist, yet Rosenblatt’s portrayal gives the character an air of wisdom and emotional depth beyond Abbie’s apparent years. Byers plays every scene with a glimmer of mischief in her eye and body language suggesting that Ronnie is both sizing up every person that she meets and preparing to spar with them. It is a delightful juxtaposition to Rosenblatt’s Abbie. Shaun Bennet Fauntleroy charms as the brilliant fixer Valerie. Like Ronnie, Valerie knows how to read people and has both the intelligence and the skill to do it well. Fauntleroy fires through technical explanations and coveys a sense of control in all of her actions and lines. Finally, Jason Howard shines as the stroke-ridden Conor. Howard’s embodiment of Conor’s medical condition is striking – from his laborious movements to his delayed speech. Howard’s Conor looms large in each scene – a generally silent fixture in the corner but a weighty presence on stage. Howard expertly navigates the complexities of his character and leaves an indelible impression. Part science fiction and part contemporary drama, Advance Man uses slow burn dramatics to gradually escalate up the tension in the room, and Rogers draws the audience into his carefully crafted world by focusing on relatable family dynamics and compelling characters. While patrons only get a brief glimpse of the alien invasion of earth in part one of The Honeycomb Trilogy, it is sufficient to make any theatregoer want to stick around to see how Ronnie and Abbie handle the invasion in the final two parts of the trilogy.